ok, I know I already posted a Tater Tot Casserole recipe, but who says we can't have more than one? Everyone loves tater tots, right? I promise you'll love this one too! And it's great for the cooking novice because you seriously need NO cooking experience. 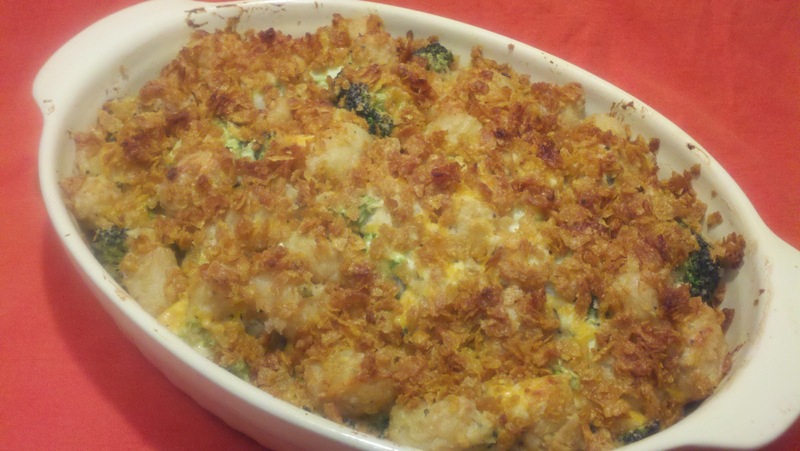 You just mix everything together in a bowl, bake it in a casserole dish, and boom... dinner's ready! And can we talk about the crunchy topping? What's not to love? Serve it up alongside some grilled chicken or maybe some broiled fish and you're good to go. You could also add diced cooked chicken to it and serve it with a nice crispy green salad. OH! You could even add some diced ham to it and serve it as a nice hearty breakfast with a couple fried eggs on top. Sounds good to me! In a large bowl, stir together everything except the butter and corn flakes. Melt butter. Stir together with corn flakes. Top casserole with buttered corn flakes. You can easily vary this recipe as much as you like. Add anything! Carrots, mushrooms, celery, asparagus, add Swiss cheese instead of cheddar, seriously, any of the above will work. If you'd like to make it a vegetarian dish, just add a different kind of soup instead of cream of chicken, such as cream of mushroom or cream of celery. I made this for my friend Abbe and we decided to add all kinds of things to it! Of course we started with the usual tater tots and broccoli, but then we added chicken, mushrooms, carrots, onions, and peas, we added half cheddar and half monterey jack cheese, and we used Special K cereal instead of the corn flakes. I par cooked everything before mixing it all into the casserole, just to make sure everything would be cooked through. A. MAY. ZING!